‘Sell As Per That’ is a one day seminar on effective selling strategies. This seminar is developed with tested strategies and practices in selling and the results are assured. This seminar would help Salesmen, Sales Team Managers, Professionals, Self-Employed, Businessmen, CEOs and for anyone who is keen about making a great career in sales. The key contents of the seminar are conceived and developed by Mr. Prasanna Venkatesan of Vertical Progress mounted on his 16 years of experience in Sales and Sales Team management. He started his career as a freelance salesman and has reached several heights in his sales career and has enabled over 1000 members of his team towards great transformation. He is an award winning sales professional who has served multinational companies in different sales platforms like FMCG, Insurance and Appliances. Vertical Progress’s expertise in sales domain has been shared through several seminars and workshops and the recipient’s testimonies reveals the success of the shared strategies in realtime selling platforms. Thousands of participants have seen growth in their sales and income. A book containing these strategies was published in Tamil and English by Vertical Progress and got great reviews. Meticulous exploration and research on the results of these strategies has served as the platform for this Seminar as a ‘one day seminar’. This seminar has three categories to serve different types of selling professionals. Each category’s content is different and exclusive. ‘Sell As Per That’ is a seminar full of practical application. It is based on ‘less theories’ and ‘more practical tools’ with a perfect blend of case studies, videos and activities. 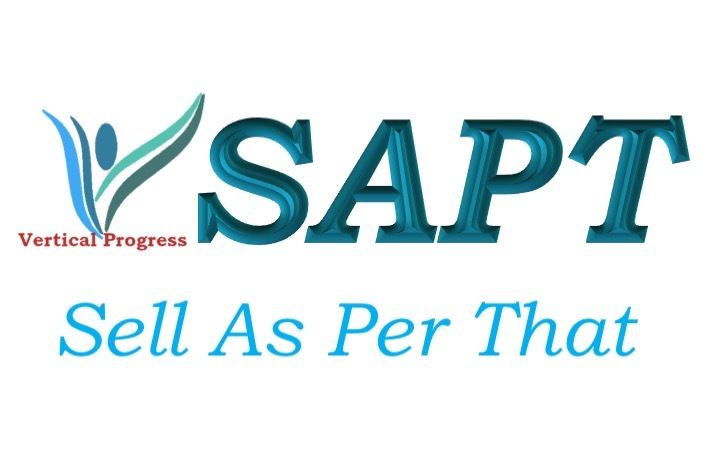 SAPT is conducted in English and Regional Languages as per the participant’s choice. SAPT offers a 30 days challenge scheme. The enrolling participants will be monitored closely and guided for 30 days to ensure growth in their sales. 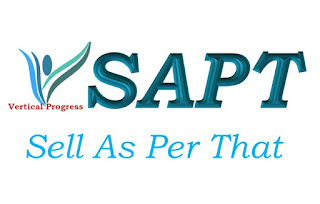 SAPT is an exclusive seminar hence the seminar is conducted only by certified facilitators. Vertical Progress conducts 3 days “SAPT for Facilitators" to certify a Facilitator. Only our Certified Facilitators will be conducting SAPT. How to become a SAPT Facilitator? As selling concepts require lot of practical experiences and understanding about selling and buying behaviours, Facilitating SAPT requires a certification. Vertical Progress mandates SAPT certification for facilitators to conduct the seminar on SAPT. Interested facilitator must join our 3 days “SAPT for Facilitators” workshop and complete the assessment. On successful completion, the facilitator will become a “SAPT Facilitator”. The fee for this 3 days workshop is INR 10,000/-. This fee is subject to change. SAPT seminars are conducted only by SAPT Facilitators. SAPT facilitators will get opportunities to conduct SAPT seminars at a nominal fee based on the opportunities. SAPT seminars organised by Vertical Progress and other associates will engage only the certified SAPT Facilitators based on their location and based on opportunities. SAPT Facilitators are entitled to promote “SAPT” and can enjoy the full remunerations from their direct orders. SAPT Facilitators are eligible to issue SAPT certificates to the participants of SAPT seminars conducted by them. SAPT Facilitators will get regular updates, testimonials and success stories from Vertical Progress. For more information, mail to “bharathtrainers@gmail.com"